November 27, 2011 Dan O. Is a silent Clooney better than a talking Clooney? On the heels of a rough assignment, assassin Jack (George Clooney) declares that his next job will be his last. Dispatched to a small Italian town to await further orders, Jack embarks on a double life that may be more relaxing than is good for him. Seeing the trailers for this one, many were actually expecting a slam-bang action thriller, that never stopped moving from start-to-finish. However, just like this year’s film ‘Drive’, that wasn’t the case so much. Director Anton Corbijn (who did a very good film called ‘Control’) has a great taste in art and what looks pretty. If you don’t believe me, just check out all of the pictures he’s taken and then tell me what you think. He approaches this film with a lot of peaceful and beautiful images of Italy that just match the whole slow-pace that this film was going for and it’s easy to see that he has a knack for making the smallest things, look pretty. The film itself is actually very slow, but never too slow to the point of where I was bored which I enjoyed very much. The whole film, I felt like was building up a lot of suspense and actually focusing on a character, without really trying to be too pretentious and go for some large idea that doesn’t have right to be in a slow-burning thriller with Clooney in it. It was also cool how this film had barely little or no talking, which just gives you a real big feeling of this is how life actually is. There are moments when not everything that’s going on makes perfect sense, but the film doesn’t try to hit you over the head and tell you what’s happening. Instead, they more or so focus on the interaction between characters without needing any words and shows that you don’t always need to explain everything with words. All you need is a good writer like Rowan Joffe to actually say something, without really even saying anything in the first place. However, where the film starts to fall is the fact that it really doesn’t work out well as a coherent story. The film can be declared an “art film” which it certainly has every which right to be, but when it comes to actually be a thrilling story, it feels a bit disjointed with all of its scenes it sort of mashes together. We get many scenes of Clooney doing push-ups, shirtless of course, then he’s eating something in a little restaurant, then he works on a gun from the beginning till the end of the film, and then we also get scenes of him getting it on with this prostitute (Violante Placido) who always seems to be naked whenever she’s on screen. Most of these scenes go by very quickly to the point as to where it doesn’t feel like they’re even necessary to begin with, and it’s another problem that Corbijn tried too much with this film as well. Corbijn makes it pretty clear that he wants us to root for this guy, Jack, by having just about every scene on him, showing him all that he does all day everyday, and giving us little bits and bits of insight into this dude’s life. However, I never really felt a connection to this character. It wasn’t that this guy was an unlikable dude, he just didn’t really seem to have me wanting for everything to be OK because of how dull his conversations with everybody were. To work as a character study, we actually need a character that we can connect with and believe in, but instead he just feels like a dude that’s there. Oh and he’s played by George Clooney. As uninvolved as I was with this character Jack may actually be, George Clooney still does play him well. Since there’s not much of a very talky script, the film depends on a lot of emotions from Clooney to bring out a lot and it works because this guy just looks like a professional no matter what it is that he’s doing. It’s a more nuance performance from him and for the most part, he succeeds in actually keeping us interested by his character’s intentions because of Clooney himself. 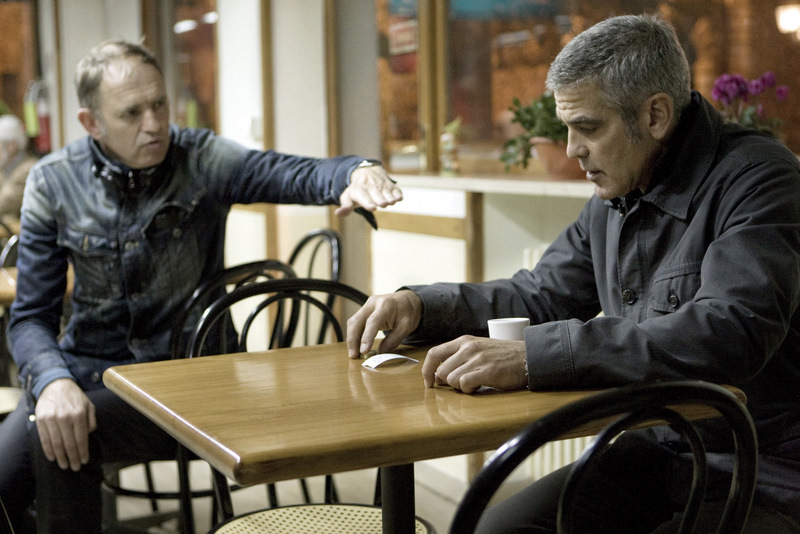 The scenes he has with Paolo Bonacelli, who plays the town priest, are some of the best in this film because you can tell that Clooney just wants to let out all that talking in the scenes but still stays back and keeps it all silent. Consensus: The American features some beautiful sights, a slow but tense pace, and a different but good performance from George Clooney, but has too many scenes where they didn’t feel needed and a bit disjointed, which doesn’t do much for the whole character study aspect of this script. I have this film on DVR but haven’t gotten the chance to see it yet. Still, I remembered Mark Kermode’s review of the film stating that the reason for its style is because, like Drive, is a variation on Jean-Pierre Melville’s Le Samourai starring Alain Delon. It’s a film about a hitman that lives in a very strict guideline of rules. You should check it out though it’s not a very conventional film by any means. Definitely should check it out if it had any inspiration on this rather cool flick. Thanks Steve! It’s funny Steven should mention Drive. The two movies share a lot in common, including of course, the nearly silent hitman. But I think there’s such a thing as TOO understated, and this movie is it. I found that it tested my patience too much. I think that’s what it was trying to do and while I don’t mind that as much with certain films, here, it kind of bothered me a tad too much. Thanks Dan! You liked this film more than I did. I thought it was just a far inferior version of the story that In Bruges told. The more dramatic version of a spy in hiding just did not work for me. Great review though. It was a good story but the way it played out in the end kind of blew. Thanks Ryan. I don’t know why and it has been a while since I saw this film, but I don’t recall feeling the film’s pace being slow at all. That’s not to say it is fast-paced but I thought the movie progressed smoothly and comfortably. American is one among the long list of films inspired by Taxi Driver-ish noir. I mean there was a time when I preferred films like those. But, this was just blown away. I could predict every scene as they happened.